This weekend I was able to do a first run-through of my WW2 adaptation for Force on Force. 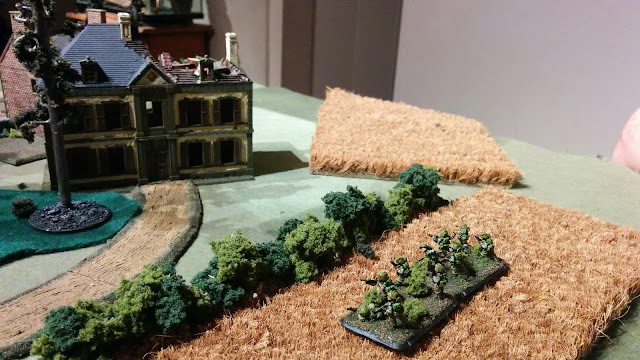 We didn't play through to the end of the scenario, because the friend with whom I was playing had his own set of rules he wanted to playtest as well, but I did learn some things in the course of running the game. 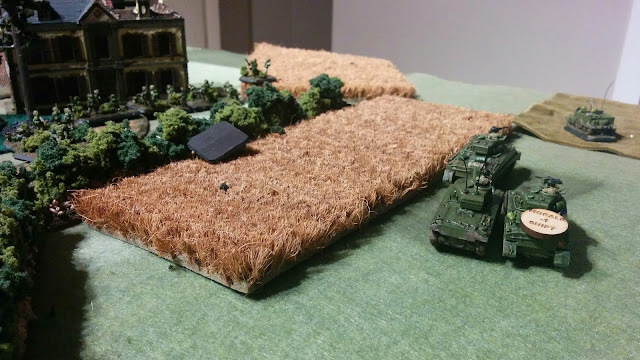 I'll put together another post with my updated rules ideas, but for now, here are some photos from the game. The first revealed Canadian troops approach St. Lambert through the fields. The Germans can see several groups of troops and one tank in the fields, but there is a lot of movement elsewhere that hasn't been identified yet. 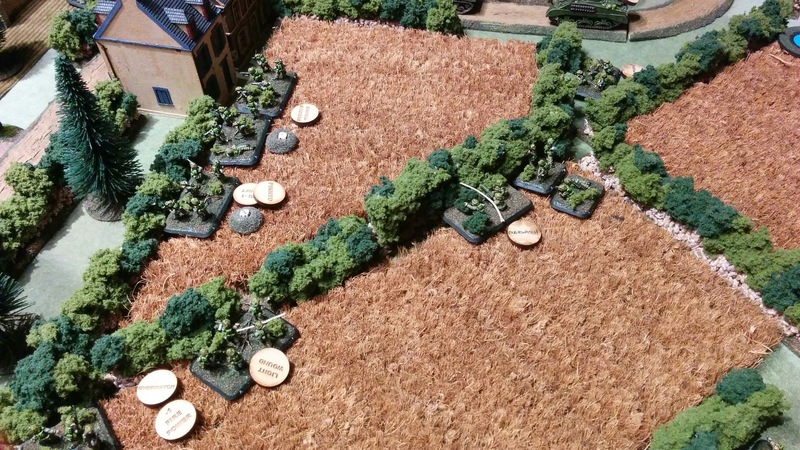 View from the church steeple on the approaching Canadians. 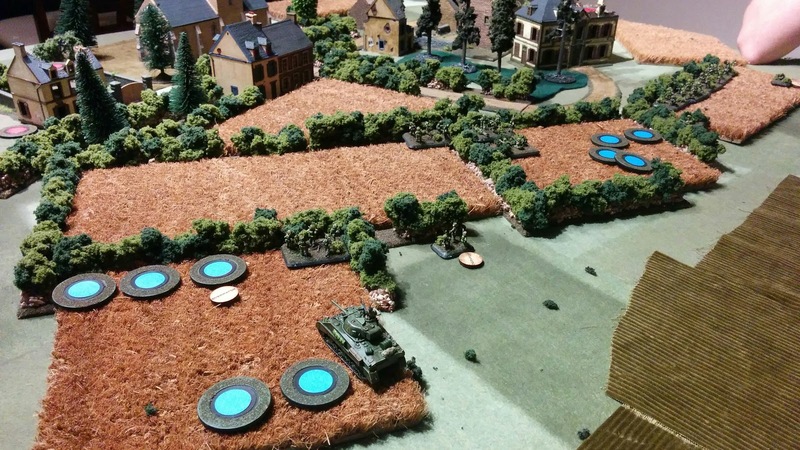 Three Sherman tanks and a Universal Carrier race across the fields past a wiped-out mortar team, trying to find a weak spot in the German defense. 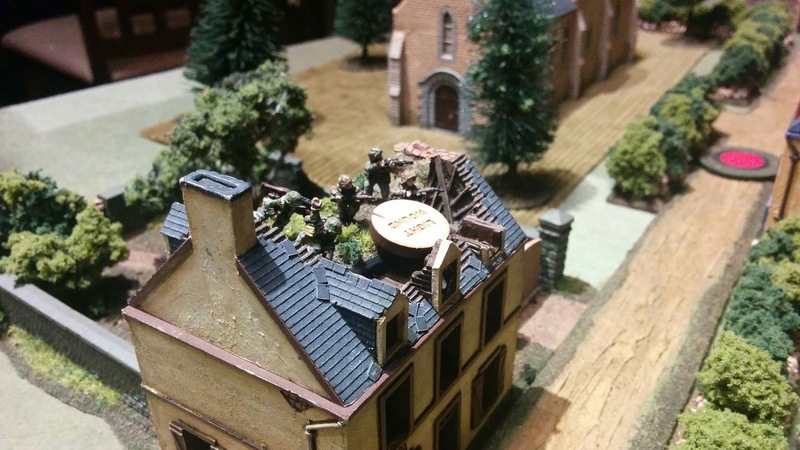 SS Panzergrenadiers fight through some minor wounds to repel the oncoming Canadians. 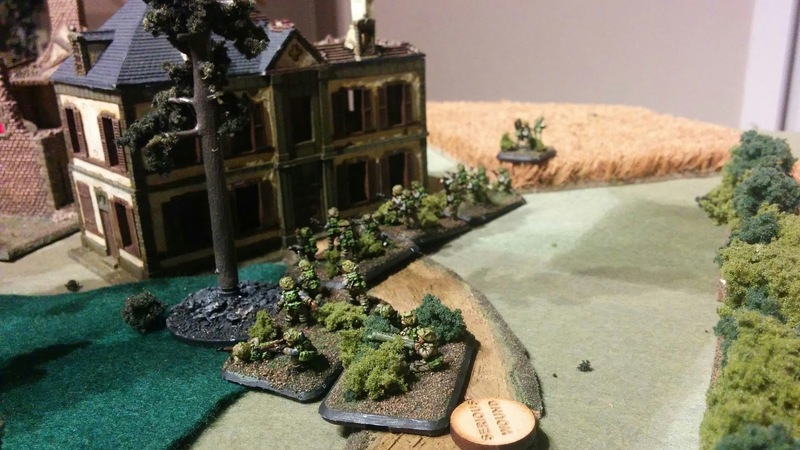 A Canadian section approaches the Town Hall, revealing one of the German tokens as a dummy. 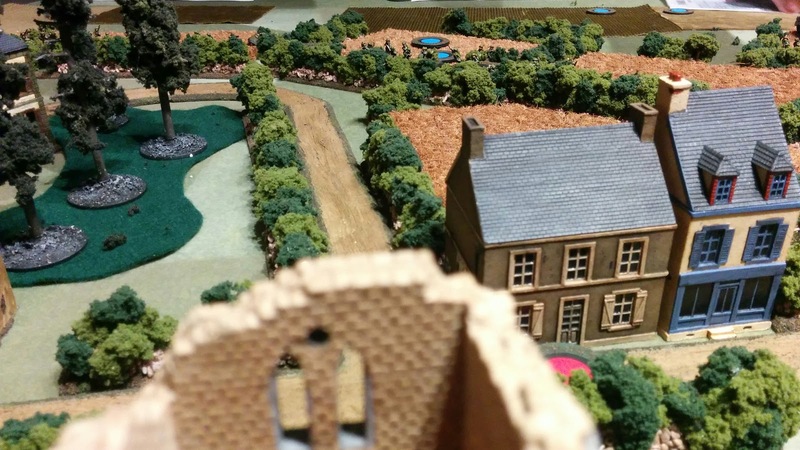 One Sherman tries to sneak around the town hall, but a massive Tiger tank crashes through a garden wall and opens fire. Luckily for the Sherman crew, the shot ricochets and does no harm. 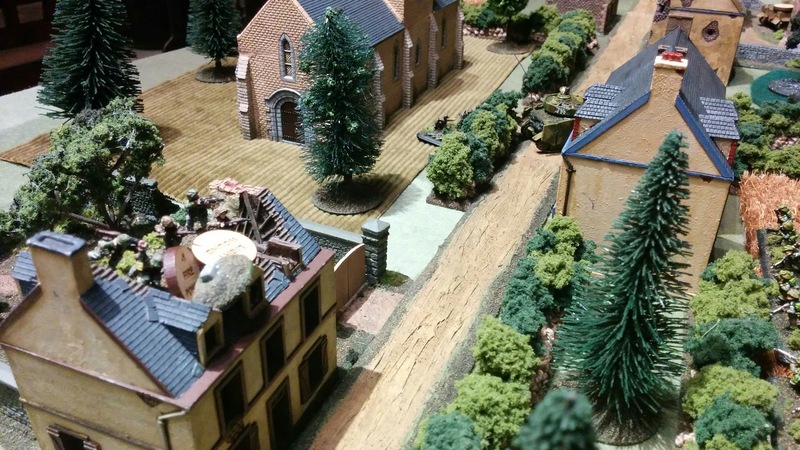 After much exchange of fire between the Germans in the town and the Canadians in the field, casualties begin to mount. 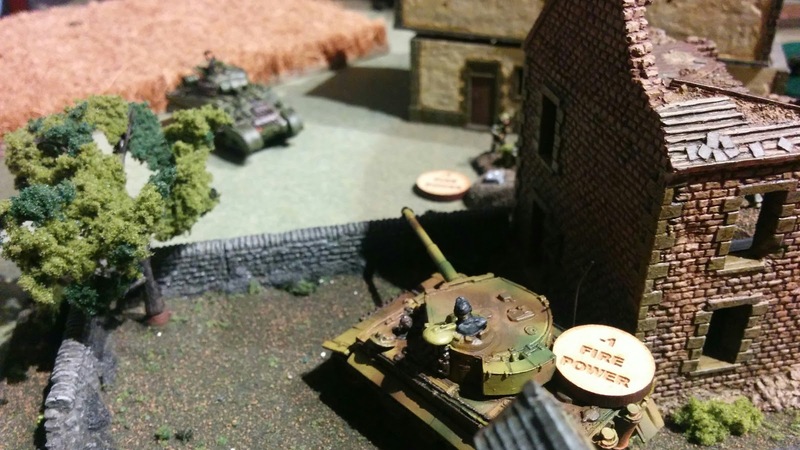 A Panzer Mark IV emerges from hiding and heads off the other Shermans at the crossroad, again failing to do any damage. And that's where we left it. We played for somewhere around 2 hours, and I think that with another 2 hours we probably could have finished off the scenario. My only regret is that I wasn't able to blow up any tanks with the Tiger!